Thank you Joyce. 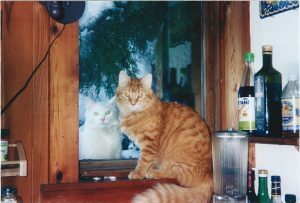 I am thrilled to read how well Red feels and how my book has already helped you in the care of all your kitties. Well, the premix food recipe is a huge success! The cats (I am giving it to Red’s brother as well) love it even more than they did the temporary recipe you gave me, which they liked too. Yesterday, I was feeling some despair over Red’s condition, since he was beginning to show considerable weakness in his back legs in addition to everything else. I thought for sure we’d be giving him fluids this morning. But surprise…he seems the best this morning that I’ve seen in many days. He came upstairs (something he’s been having trouble with) to demand breakfast, play-fought with his brother, and seemed cheerful and more energetic. Fingers crossed! (Paws too). I am just so grateful for the work you are doing. Providing the mixes makes fixing truly nourishing food so much easier and more accurate. I’ve started reading your book, and learned something I wish I’d known years ago, which is the value of having yearly blood tests after about age seven. I’ve never heard any of the vets I’ve been to recommend this, but it seems so logical, and would have helped Red (and several of my other cats in the past) a great deal. I have an appointment for after the new year to get blood tests done for my other two cats. I also started Red on the Thyroid supplement last night too. I gave it according to the directions on the bottle–1/2 tablet per day. Does that sound right to you?